Galvanizers Association is the source of free information and advice about hot dip galvanizing, cost effective corrosion protection and the galvanizing industry. Feel free to contact us on +44 (0) 121 355 8838 if you need any assistance on design, specification or advice on performance. Specifiers and end users often anticipate that batch hot dip galvanized steel will have a uniform bright colour and appearance. In practice (…) some variation in coating appearance might occur. 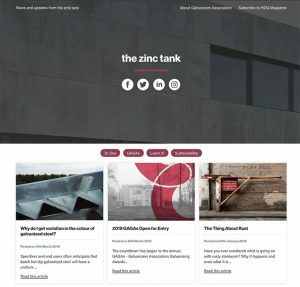 We have recently launched ‘the zinc tank’, where we will inform you about the latest technical insights into the process, performance and the many uses of galvanized steel. 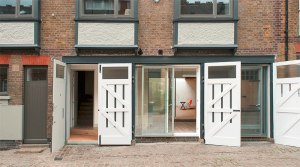 The small footprint is matched by a small developmental impact; a new building has been reassembled from the old parts of the original building. The walls have been augmented with breathable insulation and the roof has been decked out with solar cells. Where would you like to view? This map provides data for the atmospheric corrosion rate of hot dip galvanizing. Search for a location and hover over the 10 km grid to obtain the corrosion rate. The map legend can be used to find the average life of an 85 µm coating within the area. Average background corrosion rates for zinc. Each grid square is 10km².